Not so good as the "Abbot" books. Six out of ten for this book which falls short of the adventures of the Abbot. Having achieved great success with his humorous bridge fiction involving the monks of St Titus, David Bird sought to move his bridge tales out into other areas. 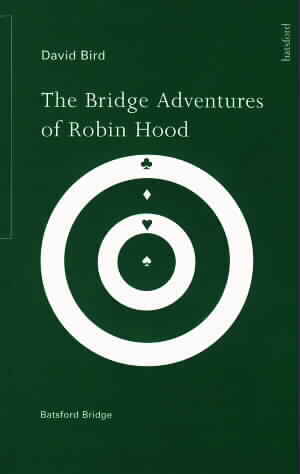 One of the first was to move the game back several centuries and have the game played by the outlaw Robin Hood in Sherwood Forest near Nottingham. As with the "Abbot" series, each chapter in the book puts the protagonists into a situation that allows them to play bridge and provides a backdrop for the humour that is what makes up such a large part of the appeal of this genre. Each hand is presented as a play problem and there is an opportunity for the reader to try to tackle it as a double dummy problem before seeing the solution found, or not found, by the players. One of the things that has changed with the new scenario is the bridge. Here, rather than playing almost exclusively in duplicate tournaments, the characters are almost always seen playing rubber bridge, often for substantial stakes. That does change the nature of the problems that are set and in general, they seem to be easier and less interesting than the puzzles that face the Abbot and his monks. To be picky the bridge problems are not without mistake. On at least one hand the line of play described in the narrative does not lead to the end position shown in tabular form. The humour changes also. While the St. Titus books are close to the "Yes Minister" school of humour, Robin Hood and his friends come right out of the bawdy end of a "Carry on" film. Keen Bridge players are rarely prudes but they are not so likely to be amused by jokes about which player ends up with which cheap whore. Compared to the "Abbot" books then, this is not so good. If your are new to David Bird, I would suggest one of the books in the monks series as a far better introduction. Fans of David Bird's bridge humour will be interested in this books in any case and, while it is not of the highest standard, it is still above average for the genre.